Ruby chocolate is the next best chocolate discovery to have surfaced within the last 80 years, ever since the finding of white chocolate. 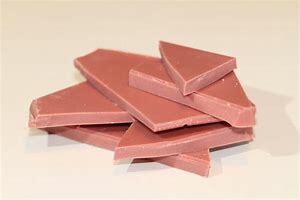 With the discovery from Callebaut coming in recent months, ruby chocolate is the fourth type of chocolate as we already have white, milk and dark. 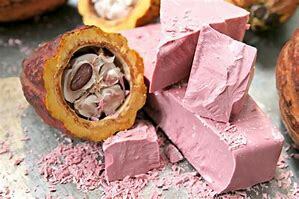 Although there is secrecy to the process which the cocoa bean goes through to transform it from the bean all the way to the ruby chocolate as we see it, while keeping the egg shelled ruby coloured effect, ruby chocolate is set to become the planets most popular chocolate within the next three decades. 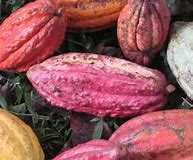 The cocoa bean used for ruby is not a new bean but its processed in a different way to get the natural berry taste sensation that comes with the chocolate. The process can only be done from certain beans, although, and they are grown in Brazil, Ivory Coast and Ecuador. With ruby chocolate having such a unique flavour which is distinctly different to the other three varieties of chocolate, it allows us to explore new ideas and tastes with the ingredients we combine together in order to create the final product. 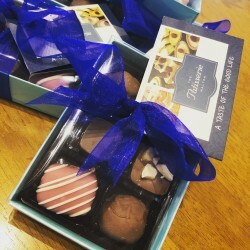 The versatility of ruby chocolate allows it to match well with anything from liqueurs to nuts such as pistachios. As ruby chocolate has only just became available to purchase, we at The Patisserie Malton are one of a very limited few within the area who use the ingredient. 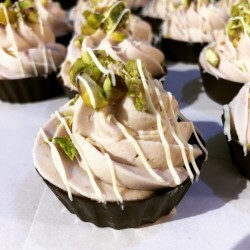 As you may of seen if you follow us on any of our social media platforms, we have already made a variety of different products using ruby chocolate; to list just a couple, a ruby chocolate cheesecake with a ginger biscuit base with pistachios and also a variety box of chocolates, one being a ruby chocolate and raspberry gin flavoured piece.